Brent's Travels: Day 28 - 2/13/14 "Wait Wait Don't Tell Me"
Day 28 - 2/13/14 "Wait Wait Don't Tell Me"
Today was my shortest travel day going from Casa Grande to Phoenix. Before I did much today I looked at Facebook and saw my friend Joe, who retired as Fire Chief from Winchendon had a birthday yesterday. People whom know me I keep a large amount if data like that but never captured Joe's Birthday. So, a text to Joe was in order. Happy Birthday Joe. He won't like me giving him notoriety, but what the heck he's a good friend. Joe has been encouraging me to put more pictures into what I write. Thanks for the feedback. 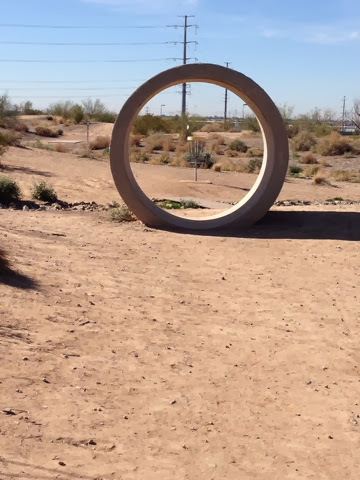 My first stop was a disc golf course in Chandler, AZ. The course looked interesting and was on the way to Mesa to visit a family friend at the trailer park that my in-laws had their place at. We came out the last time in September of 2012 to clean it and sell it. A sad time then. Back to the disc golf course. 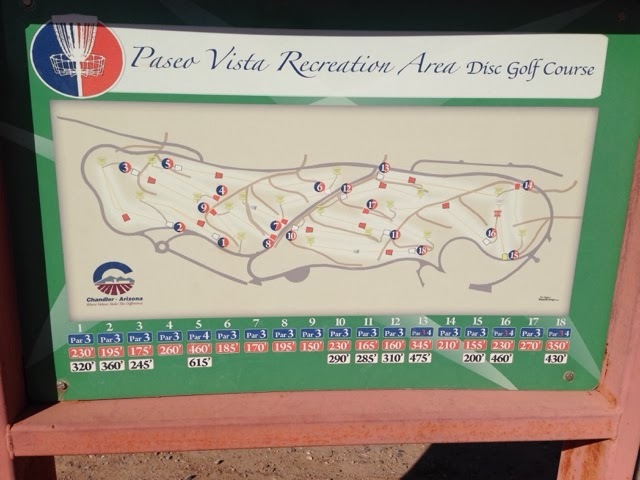 The course had a good layout and you could tell it was originally built for 9 holes and the second 9 were added later. My playing grove I found yesterday lasted into today with some great drives that gave me a couple birdies. One of the holes looked like a Miniture golf design with a hole I think they wanted you to shoot through. See the basket on the other side of the pipe. It was a very good course but not to challenging. I would classify it as basic skills course where you could take someone to learn and build skills. So I arrived in Mesa after my game and had about an hour and a half before I was to check in at a campground. I met Bob outside his trailer walking a little furry white dog. He and Kathy got the dog from the neighbor's family. The neighbor to the side of their park model fell broke her hip, was put into a nursing home where she died. So the family offered the dog to them. They just got it. The funeral was this am. Kathy was not feeling well so she was resting during my visit. Bob and I caught up as much as we could in a short time on happenings with our families. I will be back in a couple of weeks and will catch up with again. I know I told all of you that I would be at some truck stop tonight but I remembered the light rail system that goes between Phoenix and Mesa. 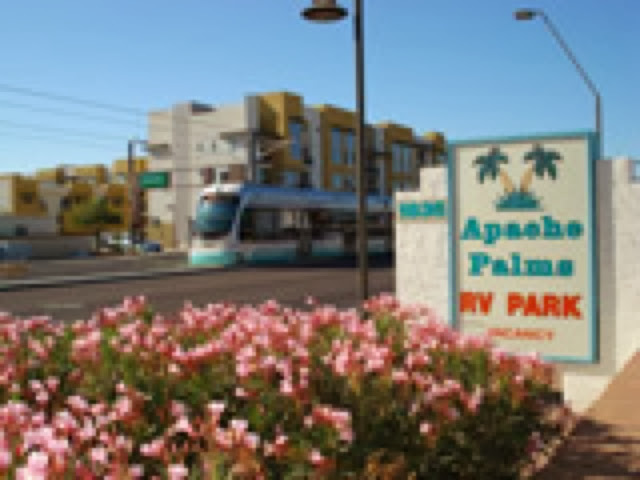 After remembering this am first thing I did was call one of two campgrounds that are located across from the light rail stop in Tempe. The first campground I called didn't have any Openings but the one directly across the street did and the price was $34. That is $10 off the regular price as I have a Good Sam Card. The reason I got the good Sam card was that Campimg World that I went to yesterday to get the sewer hose is tied to Good Sam Club and you get a discount on purchases if you are a member. Well that sewer hose I bought I saved $17 by paying the $25 membership fee to Good Sam Club. Well the $10 I saved tonight I have already made out by $2. My second reason I wanted to stay in the area is that I am coming back for a 2 week stay and want to have some stability in where I will stay. I have been stopping and starting in so many locations so many nights already that having a single spot that I could use as a base would be helpful, although restrictive if I want to make side trips. They offered a overflow site next to the pool for the 2 week stay. It's not a regular site but would be ok as it's a pull through and makes for easy coming and going. I checked it out and it's not bad, but I am going to sleep on it. Oh "Wait Wait Don't Tell Me". This is an NPR Radio Show that is normally recorded in Chicago, but from time to time the show travels. While listening to a show some time ago before I retired I heard they would be having a show in Pheonix at the time I was traveling to San Diego. Today is the day and I'm at the show. I have told many people about this show before and during the trip and no one knew about it except Shannon that I met at the Tucson Fair Grounds. Shannon was the woman Iet that used to live in Westminster. 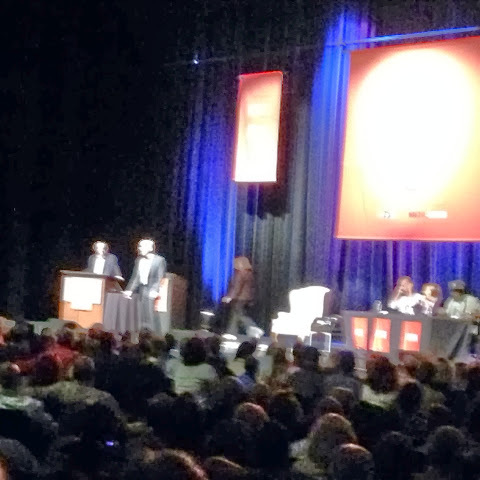 It was a funny current events news show that was sold out at 4600 people here in Phoenix. Carl Castle to the left and Peter Segal with 3 guest panelist to the right. The chair in the center is for a special guest and tonight it was AZ Jr Senator Flake, from Snowflake, AZ. No kidding on this. The town was named in part after his family. 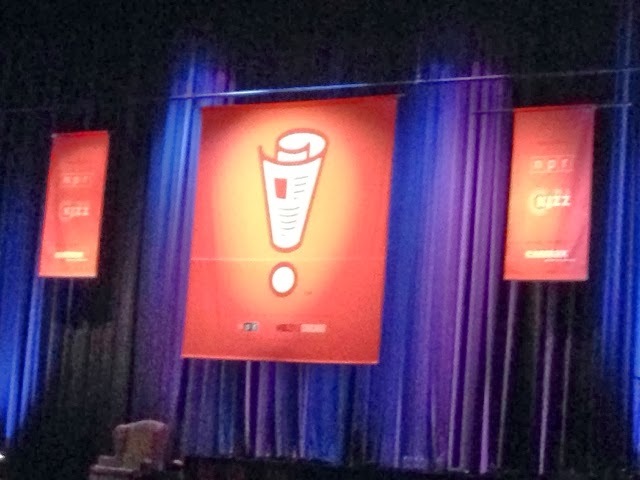 You can listen to the show on NPR radio or go to the Wait Wait website to listen, or do like me download the podcast. This was not a white hair event either. There were all ages. My lovely wife Denise would have liked the comedy relative to the show being a liberal show. Senator Flake is a Republican, so the comments would have fit well with Denuse's beliefs. Tomorrow I am headed west on my way to San Diego arriving Sunday. I don't know where I will stay yet but I will figure it out as I go. The uncertainty doesn't bother me as I am self sufficient for a few days in the camper. Day 30 - Coast To Coast!